Miami musician Clarence Reid could be your cranky grandfather… until he puts on his gold-spangled superhero costume and starts singing some of the raunchiest tunes you’ve ever heard in your life. Having changed the game in 1965 by recording what may well be the world’s first rap song (“Rap Dirty aka Blowfly’s Rapp”), Clarence has shocked and grooved audiences for over forty years with Blowfly’s hilarious and provocative hard-core songs and stage antics. But before his X-rated career began, Clarence was a major force in the renowned Miami soul scene of the 1960s and ‘70s; writing Top-10 songs for some of the greatest R&B acts, including Betty Wright, Sam & Dave, Gwen McCrae and KC and the Sunshine Band. His songs have been sampled dozens of times by acts such as Ice Cube, Wu Tang Clan, and Beyonce- but having sold his royalties for virtually nothing, he’s seen no income from any of it.So he continues to take his show on the road, playing small clubs and questionable bookings in front of hard-core bands all over the world. 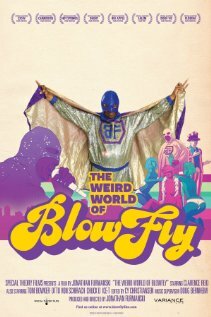 An intimate and revealing portrait shot over two years, The Weird World of Blowfly examines Clarence's personal and professional contradictions, explores his legacy and celebrates his musical and cultural significance as a rap and soul music legend, and paints a picture of an unheralded, complicated, and stunningly profane man that is as touching as it is obscene.